You never know when you might find yourself in a precarious situation, whether it be during your next adventure or in a natural disaster. 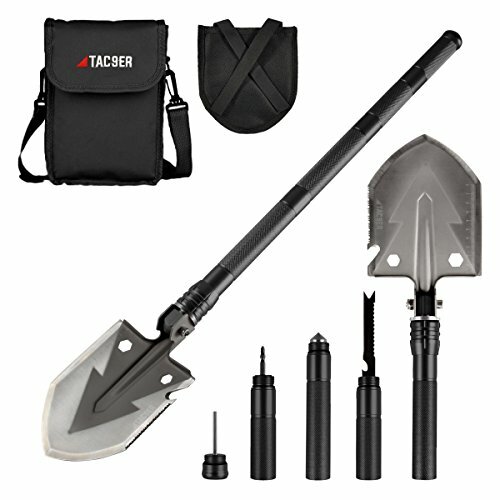 Be prepared for any survival or emergency situation with Tac9er's Tactical Multi-Tool Shovel. This 15-in-1 multifunction tool is crafted from solid steel and aircraft grade aluminum, built to withstand the toughest jobs. Need a hoe, axe, knife, or fire starter? How about a wire cutter, hammer, or compass? This versatile multi-tool shovel has got you covered! Compact and portable, it's perfect for your backpack, bug out bag, garage, or trunk. You'll never want to leave your house without this life saving tool! Each Tac9er Tactical Multi-Tool Shovel comes with a 100% money back guarantee. If you are not satisfied or would like to exchange your product, we are happy to do so WITHIN 30 DAYS of your purchase date. 15-IN-1 MULTIFUNCTION TOOL - Tac9er's Multi-Tool Shovel includes an axe, hex driver, serrated knife, wire cutter, hoe, harpoon, saw, rescue knife, bottle opener, safety hammer, compass, Phillips head bit, flathead bit, and fire starter. Be prepared for any situation! COMPACT AND PORTABLE - This shovel weighs just 2.2lbs but extends to 29" in length when fully assembled, giving you the leverage you need to get tough jobs done. It's incredibly portable and compact, the entire shovel fits in an upgraded 9"x6" carrying pouch made from heavy duty nylon. Perfect to store in your bug out bag, backpack, garage, or the trunk of your car. BUILT TO LAST - Forged from carbon steel and aircraft grade aluminium, Tac9er's Multi-Tool shovel is made to last and is constructed to withstand heavy duty entrenching and digging jobs. The lock system ensures the blade stays put at 40°, 90°, or 180° angles, keeping you safe and protected. VERSATILE - Great for camping, backpacking, hiking, off-roading, fishing, survival, emergency situations, RVs, military, law enforcement, hunting, gardening, and more! WARRANTY - We stand behind our products. Tac9er's Multi-Tool Shovel is backed by a 1 year no questions asked warranty. You break it, we replace it. Period. If you have any questions about this product by Tac9er, contact us by completing and submitting the form below. If you are looking for a specif part number, please include it with your message.